A lawn just does not look finished and pristine until it is properly trimmed. With the right tools and machinery, an unattractive and shaggy garden can be transformed into a stunning landscape. Undoubtedly, the best tool for accomplishing this task is the string trimmer. String trimmers are fantastic for maintaining crisp, neat edges along garden beds, walks and even slightly irregular hillsides which are difficult to mow with a standard lawn mower. String trimmers operate by cutting with rotating plastic lines. What makes owning the string trimmer even better is that it a variety of plant grooming problems are tackled with the best performance and results at a one-time price. A mower just does not ‘cut’ it, and even a garden worthy of receiving a blue ribbon will look shabby if there is tall blades of grass protruding around trees and between fence posts. The string of a string trimmer is available in different machines in a range of textures and thicknesses. We think it is safe to say that for most cases, the heavier the machine, the better. However, the texture of the string will have to be determined depending on an individual’s landscape. Trimmers themselves are categorized into two: the economical yet effective electric trimmer (either corded or cordless) and the powerful and usually costly gas models (available in 2- cycle and 4- cycle engines) Again, the right trimmer selection depends on the size of your property and its respective terrain, as well as your tolerance for pollution and engine noise. Also, be mindful about getting a complete safety kit. Trimmers spin at approximately 400 mph, making eyes and ears protection absolutely essential, along with long pants, gloves and boots. The Craftsman 25cc 2-Cycle gas weed whacker is designed with a curved shaft which is not only smoother to grip but also makes accessing hard to reach spots around your yard easier. A remarkable fact which we don’t want to miss pointing out is that this trimmer is excellent for adults who don’t have a tall stature. The curved end is great and doesn’t tire out your arms fast, but we noticed that it does reduce the extended length of the machine in front of you, which is why extra care is recommended while handling this contraption. 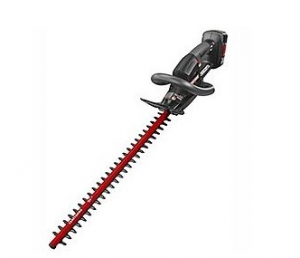 As a gas trimmer, the product is decent for cutting grass and acceptable for small branches and weeds. The unit vibrates a lot, which may or may not be to your liking. The biggest complaint however, is the noise. 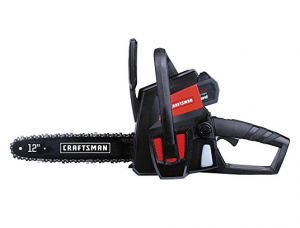 It is understandable that trimmers in general do make noise; the Craftsman 25cc’s noise output was a whopping 108 decibels, making it the loudest string trimmer in this list. In contrast, certain weed eaters are at least 12 decibels lower. According to the Occupational Safety and Health Act (OSHA). One should wear hearing protecting when exposed to noise exceeding 85 decibels. This Craftsmen gas trimmer is quite compact in size, which makes its 16-inch wide cutting path well above average. The arc created while cutting is greater, meaning that your task is done quicker all the while eliminating weeds. The results are definitely not lousy. The fact that the trimming is done in lesser time makes up for the small storage of only 10 ounces of gas by the machine. Additional energy is saved by bring the machine head to a halt when the machine is idle, also giving breaks in the noise level. The string in this weed whacker has dual-line functionality, rotating two strings as the head is in motion, resulting in more precise trimming. The string doesn’t wind though, instead it has to be threaded via the head. You may purchase an entire spool of string or cut-up strings from your local store once the string starts to wear down. If there are any problems experienced, Craftsmen online support is outstanding, and the gas trimmer comes with a warranty lasting two years. Here is a fun fact: the Weedwacker label has been so phenomenally successful over the years that the name ‘weed whacker’ has now become a generic word widely used for trimmers and other similar machines. Such is its popularity. The 41ADZ46C799 is a four-cycle gas engine, part of the Weedwacker line; with all the power and performance one can need for chopping grass and weeds on your property. What’s more is that this trimmer is ridiculously simple for anyone to operate. The customization options available by purchasing different attachments is also much appreciated, turning your Weedwacker into an all in one solution for landscaping needs. All the essentials of a grass trimmer are featured in this model of the Craftsman Weedwacker – it is simple to use, operates quietly, and has a powerful and reliable engine. The power is attributed to the four-cycle engine, better than other weed eaters. The position of the D-shaped shaft can be changed to accommodate different users with varying heights. Being a 2- cycle trimmer, the 25cc gas trimmer by Craftsman is extremely loud (the loudest in fact) whereas the Weedwacker 41ADZ46C799 is amazingly quiet, which considering that it has a powerful 4-cycle engine, sure is something. Craftsman has really done their homework with this model. Not only is the four-cycle engine remarkably quiet yet powerful, but the Weedwacker is also equipped with anti-vibration, allowing you to comfortably operate the machine for long durations. Durations more than an hour will burn through the entire 12-ounce gas tank and will need refilling. The head of the trimmer has two exit points for the nylon string, so the trimming can be done twice as fast. The cutting width is the narrowest in this list, which again is balanced by the two exit points. Craftsman somehow makes sure that any negative aspect of its product is rectified by a counter feature. The fantastic features of the Weedwacker don’t stop here. The trimmer has an easy-start set up, offering three different ways to start the engine. You will be happy to know that the long prevailing problem of kickstarting the machine by pulling the finicky cord has finally an alternative. The three options are; Incredi-Pull coil, a P3 electric starter, and finally a Power Bit Start add-on which is compatible with most drills. The last two allow the user to begin the process of eliminating weeds without requiring pulling of the cord. It will need additional equipment though which still beats the cord pulling. The Incredi-Pull coil system as the name suggests, does require pulling but does so rapidly and easily. For safety, a debris shield is provided to not only shield but also keep your face and clothes tidy. The Craftsman 21212 is the first electric trimmer on this list, and its speed is nothing to scoff at. The trimmer’s head tilts three different ways to execute precise trimming angles. Work time is also cut-down due to the two feed lines. 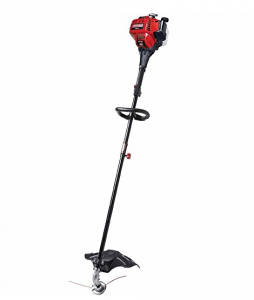 The head on the 21212 electric string trimmer rotates at 9,000 rotations per minute. Power and speed of electric string trimmers are crucial as these are the determining factors for the trimmer’s performance. The 21212’s rotations are on par with higher end trimmers. Electric trimmers tend to get a bad name simply because their performance is considered average when compared to a gas trimmer, but in the case of the Craftsman 21212, apparently neither performance nor features are compromised. That being said, this electric weed whacker is more suited for light trimming and not heavy-duty tasks. The trimming path is 12 inches wide, making trimming larger areas quicker. The device too is lightweight at only 5.24 pounds, so holding it won’t exhaust you, which is not something that can be said about all electric string trimmers which tend to be heavy. For advancing the line, the head can be bumped lightly. People prefer the bump mechanism than the automatic string proceeding as the user can track how much line is used more efficiently as you trim. A standard 0.065-inch diameter line is used by this electric string trimmer. Furthermore, there are two feed lines for double the effectiveness. Another noteworthy feature is the telescoping shaft situated right underneath the front handle. One can switch directly to edging from trimming due to the handle being able to rotate 180 degrees. The shaft length is also adjustable thanks to the telescoping shaft. The head of the trimmer bends in three various positions, ensuring the perfect angle for tackling the job. One position is for storing the unit while the other two are for edging and trimming. The head is adjusted to the respective angles simply by pressing the pivot button. 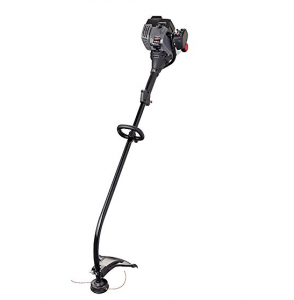 The Craftsman electric trimmer comes along with a grass deflector which protects and expels any debris. Despite the grass deflector always staying in place, it is always recommended that you wear proper protective boots and other safety equipment to minimize injuries. 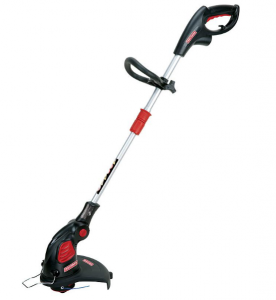 Excellent speed and performance for cutting through grass and weeds. Some people may prefer an automatic feed over the bump mechanism. The C3 electric string trimmer is a part of Craftman’s range of power tools which are compatible with the company’s C3 battery system. This makes this product versatile for those who own other C3 machines, but the average power and modest battery life prevent this trimmer from truly performing as well as larger gas-powered and electric corded trimmers. The C3 comes with an adjustable telescoping shaft, with the trimmer head rotating and alternating between a vertical trimming position and horizontal orientation for edging. The line feed system is automatic, advancing without any prior input from the operator. The C3 trimmer is equipped with a high performance lithium ion 19.2 volt battery, but the great thing is that it is also compatible with the previous C3 nickel cadmium batteries. The company states that the lithium battery is state of the art and delivers double the run time of the standard nickel cadmium battery. Charge time is almost one hour, but once fully charged, the trimmer will run continuously for some time without stalling. The trimmer also works with the newer lithium ion XCP, which according to the manufacturer, runs four times as much as the older nickel cadmium battery. Long operation duration on single charge. The Craftsman 40V cordless string trimmer was faced with a lot of skepticism when our team first tried it out. It seemed that this trimmer is just not cut out for any major landscaping work and just does not have the power to cut through the rough test bushes. Incredibly, this device holds up well on its own. The performance is acceptable for more than just basic work and even though it requires some assembly straight out of the box, the set up is quite intuitive. The components snap and bolt together seamlessly without requiring much exertion or excessive screwing. Once assembled, the product is quite solid and flexible, whereas we were expecting it to be flimsy. The ‘Power Command’ can be adjusted in the handle with the opportunity cost of greater power for lower battery life and vice versa. A safety switch is on the product which needs to be pressed with the forefinger or thumb before pulling the trigger. It is quite easy to get used to. The product comes with a two-year warranty. Will require selecting between power or battery life at each use. If you don’t want the hassle and mess of dealing with oil and gas, then you may want to opt for an electric string trimmer. But be advised, the gas-powered trimmers today are far more energy efficient than they were in the past. Electric powered trimmers either corded or cordless, although not as powerful as gas/oil models, will get the job done of making your lawn trim and tidy. And it will operate while releasing less pollutants and generating less noise, so you may be lenient or less cautious using the latter than the heavier gas/oil string trimmers.